The CSL in on for an electrifying weekend. For starters NY Pancyprian Freedoms and Lansdowne Yonkers F.C. will take on each other in the first round of the Lamar Hunt U.S. Open Cup qualifiers. Powerclub Cedar Stars Academy will face Shamrocks in their home opener while Doxa S.C. and Central Park Rangers Whites will look for their first win of the season against each other. As usual, NY Pancyprian Freedoms will go head to head with their fierce rivals Lansdowne Yonkers F.C. in the first round of the Lamar Hunt U.S. Open Cup qualifiers on Saturday at 8:00 p.m. at Tibbetts Brook Park Field 3. Lansdowne got the best out of the Freedoms the last two times they met in Open Cup qualifiers, defeating them in penalty kicks last year after a 0-0 draw and in extra time in 2016. NY Pancyprians' winger James 'Jimmy' Nealis, an ex-Lansdowne player, shared that his club is keen on getting an avenging win over the Bhoys this season. "I think the whole organization is looking forward to a different result this year against Lansdowne," Nealis said. "They have made some key signings to strengthen the squad and I know the players are pumped up to play Saturday. We are going to have to match their intensity and work rate on Saturday if we are to come away with a win." Lansdowne lost four key players from last season, Tom Wharf, Jean Voltaire, Pat McCann and Joseph Lopez as well as their head coach Austin Friel, who won 2017 Region I Coach of the Year. Defender Sean Kelly stepped up for Friel as the Bhoys' player-coach and the club added 14 players to their CSL roster. The Irish club is 4-5-1 in all competitions during their transition period, which includes two recent losses to Shamrocks, 3-1, and Cedar Stars Academy, 4-1. Despite the Irish club's rough transition period, Nealis noted that Lansdowne is still a dangerous team and commended their new player-coach Kelly for his leadership skills. He later added: "No matter the time of year Lansdowne always puts a quality squad on the pitch. I used to play with Sean Kelly and I have total faith in him to maintain the high level of play that we have seen over the past couple of years from Lansdowne. As the captain, when I played for Lansdowne, Sean was a natural leader and a big reason for our success there." The Freedoms won their first two CSL matches while scoring the most goals in the league, 13, and conceding the least, 1. As for players to watch in the encounter--if they do play part in the game--Lansdowne new signing Jack Doherty, a former League of Ireland player netted in his debut for the club against CSA. And for NY Pancyprians, 23-year-old Grenada international player Shavon John-Brown tallied a goal and an assist in his first two games with them. Powerhouse Cedar Stars Academy will host Shamrocks on Sunday at 11:00 a.m. at Ramapo College. 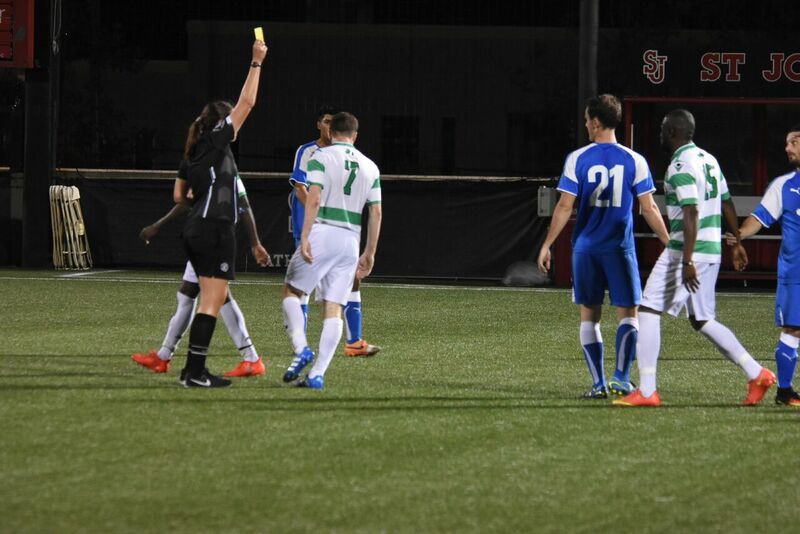 Cedar Stars won their lone CSL game so far and captured one-day tournament Rapaglia Cup last weekend while besting Lansdowne 4-1 and Brooklyn superclub Grenada 2-1 in the final. The Stars acquired reigning Region I Coach of the Year Austin Friel as their new head coach last week. Friel will more than likely make his debut against the Rocks this Sunday. The club also signed ex-U.S. international Danny Szetela on Wednesday to add to their roster that’s already loaded with former professional players. Shamrocks forward Kurt Cameron acknowledges that CSA is one of the most in-form CSL teams now hence he expressed that his side must perform at their highest quality on Sunday. "We know they're one of the hottest teams right now and we'll have to bring our best game against them. We're focused and will be ready to play on Sunday." The Rocks were victorious in their first two games of the season, in which they played Lansdowne and Doxa. The game will feature four players in the Top 5 Scorers chart: Cameron (3 goals), Rocks forward Travis Blair (2 goals) and CSA forwards Christopher Katona (4 goals) and Bledi Bardic (2 goals). Doxa S.C. and Central Park Rangers Whites will battle for their first victory of the young season on Sunday at 9:00 p.m. at Joseph F. Fosina Field. Doxa started their season with two rough losses versus NY Greek Americans, 3-2, and Shamrocks 3-1. "We're very disappointed we couldn't get anything out of those first two games that we truly deserved," Doxa head coach Paul Grafas said, "but we're going to come out hungrier this weekend versus CPR." Kareem Joachim leads the Greek club in scoring, tallying three goals in two matches. Joachim is also keen to win his first match of the season with Doxa on Sunday. As mentioned CPR will also be fighting for their first victory of the season. They lost their first match to Hoboken F.C. 1912 4-0 and drew with NY Greek Americans, 1-1, last week. NY Athletic Club will travel to Randall’s Island Field 75 on Sunday to take on Zum Schneider F.C. 03 at 8:00 p.m.
Zum lost their first two matches of the season, falling to Cedar, 6-1, and to NY Pancyprians 7-0. NYAC on the other end drew their last game with Hoboken F.C. 1-1 after losing to the Freedoms 4-1 on opening weekend. NYAC midfielder Jake Mann is unhappy with the first two home-results but he's optimist for Sunday's match as he noted that his side looked better after each outing. Last time the two clubs met in the league, the match ended 2-1 in Zum’s favor.